Levees and floodwalls are among the main structures used to confine the river water and prevent flooding the adjoining countryside. 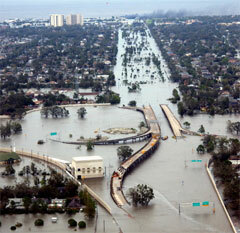 Levees and floodwalls are especially important when the water level rises due to heavy rain and storm. When levees and floodwalls fail, the disaster strikes and rushing water floods the area resulting death and destruction of houses, farms and industries. In the last days of August 2005 a category 5 tropical store named hurricane Katrina moved inland in the Mississippi area. Its storm surge soon breached the levee system that protected New Orleans from Lake Pontchartrain and the Mississippi River. In this experiment you will test the effect of different steel reinforcement designs on the strength of levees and floodwalls. You will not have to use real steel and concrete for your tests. You will substitute those with materials you can find locally.